I finished these a while back, but I had been delaying the blog post because I hate the pictures. Sons of Horus are difficult to get pictures of because the blue-green of their armor reads as blue or green by the camera sensors. At least when I take the photos on a blue background! But with my new backdrop, the colors turned out much better. I'm still working on the process of painting them, I'm not 100 percent happy with how these turned out, but I like where they are headed. Of course it probably didn't help that my airbrush needed a good cleaning when I did the paint. 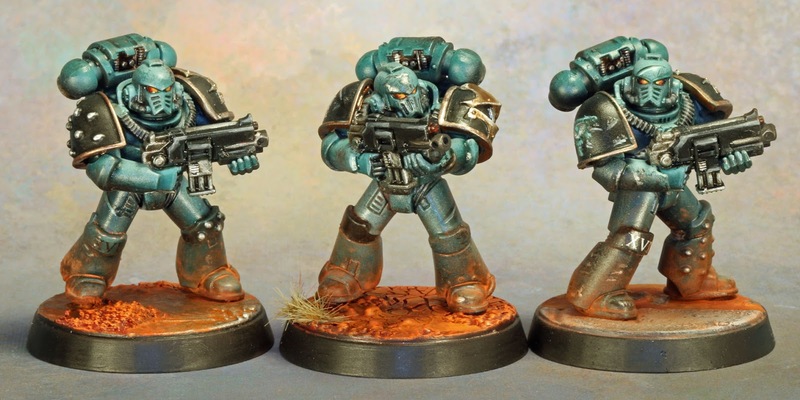 Speaking of my airbrush, the bulk of their armor was painted over a black prime (which is rare for me) and beginning with Forgeworld Nocture Green followed by Lupercal Green from about a 30-45 degree angle and followed by Sons of Horus Green at about a 60 degree angle. After that I mixed in a little Dawnstone and Sotek Green from straight above. Then I edge highlighted by brush with Vallejo Model Color Light Sea Grey. Finally, I sprayed the whole model with a 50/50 mix of Coelia Greenshade and Lamhia Medium. I might have applied two coats. After that, a black oil pin wash was applied to all the cracks and such between the armor. The brass trim was Runelord Brass, washed with Agrax Earthshade and highlighted back with Runelord Brass and then with Sycorax Bronze. 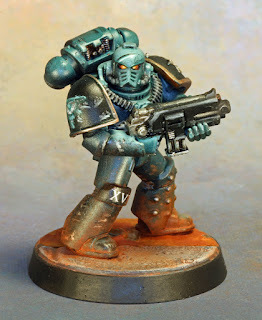 The weathering was applied by applying Dryad Bark with a sponge, followed by stippling Leadbelcher and then Stormhost Silver. I also painted some thin black lines to represent dents. Finally, I applied highlights under both the scratches/dents and the chipping using various shades from the armor as appropriate. For the bases, I wanted to do two things. I wanted something that would pop and I also wanted something reminiscent of the world Murder from the novel Horus Rising. This worked out great since red is the opposite of green and will give me that pop I wanted. The bases were just dark red, drybrushed with bright red and then Ryza Rust. 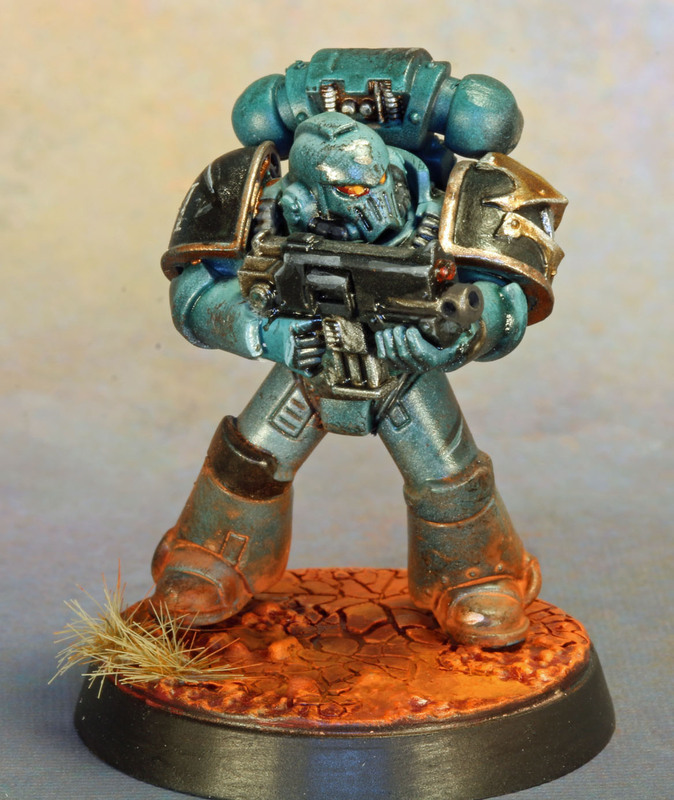 On the marines themselves, I applied various rust pigments mixed with a little rubbing alcohol to simulate the dust from the planet. 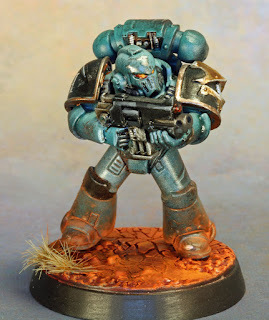 I also wanted to share this YouTube video from Dizzyfinger on how he painted his Sons of Horus. I didn't follow it directly, but I found it very helpful with a lot of ideas. It's in german (and I don't speak German!) but he shows you all the paints he uses so you can follow along. These models were great to paint and I can't wait to get to the next batch. I may just paint an army yet! Looking great Andrew! 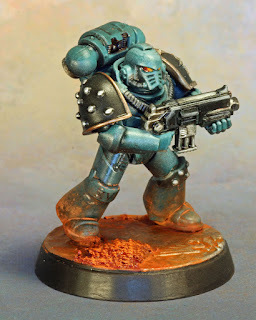 I love the armour colour. Wow, I have to say these are magnificent!! Thanks! I need to go digging through your blog for inspiration, then. There looks to be a pretty detailed pick on the right shoulder of one. Is that amazing freehand work or a custom decal or something else? The decal itself is a yellow cup shaped eye. After applying it, I hit it with some varnish and painted it green, then sponged over some damage effects so it didn't look too crisp and clean (although I think I over applied). Very cool effect. That decal sheet looks vaguely familiar, though I'm not sure I ever owned it. The decal sheets sure do stack up over the years though! The metallic blue shades are stunning, congrats! Top drawer brilliant painting, Andrew. It's just a small detail, but I love the clay dust on their legs. Thanks! These ended up being some of my favorite models I've done in a long time!